Should You Pursue a Graduate Degree in Accounting? Take the required accounting coursework for CPA exam eligibility as a non-degree-seeking student. Available at some colleges and universities, a non-degree-seeking option may be a good fit if you are already working and have built a professional network. This approach would help you meet the requirements for the CPA exam and may provide more choices in course delivery, such as evening, weekend or online classes. 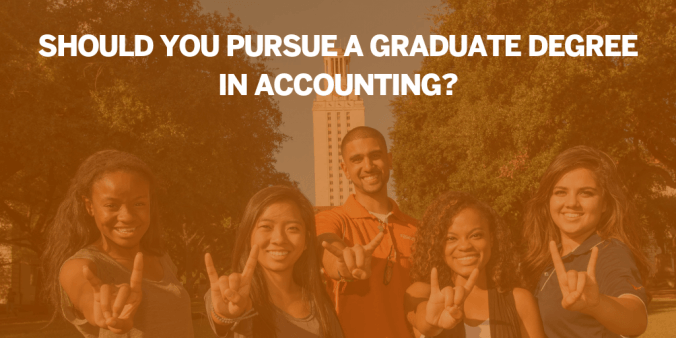 Study a graduate degree in accounting, such as the Texas McCombs MPA. This is a great option if you are seeking employment opportunities, want to expand your professional network and would like to enroll as a full-time student. The benefits of a structured master’s degree program include dedicated career services, connections with students and alumni, networking opportunities with employers and the addition of a higher-level degree to your credentials. Most graduate accounting programs require specific pre-enrollment courses. The Texas McCombs MPA helps you to make an easy transition to a new career by requiring only five pre-enrollment requirements, which can be completed at a local community college. Contact us if the Texas McCombs MPA sounds like a good match for you!